Pat Henshaw author of Redesigning Max answers five easy questions to help readers get to know her better. Since I’m from Nebraska, I’ll have to go with the staple at our house: grilled steak, homemade potato salad, fruit salad, and ice cream for dessert. I love the coast around Pacific Grove, California, so my perfect vacation is one we take a couple times a year. We drive to Pacific Grove, check into a small cabin there, walk down to the shore, dawdle for a few hours, then go to dinner. The next day, my husband drops me off at the coffee shop downtown, where I get a glass of iced tea and whatever homemade bread they have on hand, and then I write until lunch. In the afternoon, I write more, take a nap, and generally enjoy the sea breezes and soft sounds of the coast. Sometimes we drive down Big Sur and stop at Nepenthe for leisurely lunch. We’ve traveled almost all over the world, but Pacific Grove is my destination of choice. I love making dollhouse miniatures in quarter inch scale. Quarter inch = one foot in real life. Lately, I’ve been making quarter inch ice cream cones. They’re really teeny, just like all quarter inch objects are. I used to read mysteries, but these days, it’s romance, particularly gay romance, that hits my charts. Renowned interior designer Fredi Zimmer is surprised when outdoorsman Max Greene, owner of Greene's Hunting and Fishing, hires him to remodel his rustic cabin in the Sierra Nevada foothills. 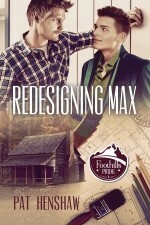 Fredi is an out and proud Metro male whose contact with the outdoors is from his car to the doorway of the million-dollar homes' he remodels, and Max is just too hunky gorgeous for words. When Max starts coming on to Fredi, the designer can't imagine why. But he's game to put a little spice into Max's life, even if it's just in the colors and fixtures he'll use to turn Max's dilapidated rustic cabin into a showplace. Who can blame a guy for adding a little sensual pleasure as he retools Max's life visually? Max, for his part, is grateful when Fredi takes him in hand, both metaphorically and literally. Coming out, he finds is the most exciting and wonderful time of his life, despite the conservative former friends who want to stop his slide into hell.